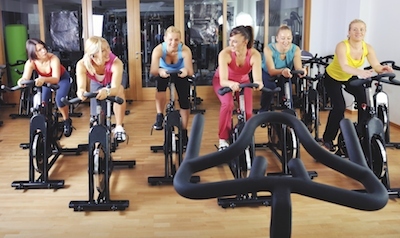 What is a “Spinning Class” Anyway? You may have heard of people doing Spinning Classes or Spin Classes and wondered what exactly it means. First of all, since “Spinning” refers specifically to the company, Spinning classes mean classes put on or licensed by Mad Dogg Athletics, the company that created the Spinning program. You can definitely get a great workout at home on a Spin bike of your own (check here for the best Spin Bikes for home), but it’s also great to workout in a class environment where there is a sense of team effort and group motivation. When you’re by yourself it’s hard to truly push yourself as you’re the only one there to keep you accountable. But if you’re in a class then you have the other participants, as well as the teacher, constantly watching over you which will give you more drive. For anyone looking in on a class it almost looks torturous: loud music blaring through the speakers, an assertive class leader shouting at people to go harder and a group of people sweating buckets from every part of their body. However, once you start you’ll never go back. So let’s get specific about what you can expect from a Spinning Class. An hour-long Spin class can burn anywhere from 600-1000 calories depending on the intensity of the instructor and the amount that you push yourself. It relies on a combination of fast-paced cycling and strategic lighter rest intervals to get you recovered for the next burst. Most spinning classes last around 40 minutes so you’ll be burning about 400-600 calories per class. Each Spinning class will have their own bikes which are fully customizable for you as an individual. You’ll be able to adjust the seat, handlebars and the tension/resistance accordingly. Make sure to do this at the start of each workout so that you’re not uncomfortable for the workout. The instructor should be able to help you if you’re unfamiliar with the equipment. Some bikes even have gel saddles to make them more comfortable and some people even bring their own. If they are not supplied and you don’t have one then padded shorts will help. The set up may be a bit different depending on the studio. In some classes the bikes are set up in rows with everyone facing the instructor/the mirror where as others will be set up in a semi circle which gives you a better view of everyone else in the room. There should be air-con in the room as well as on the bikes, too, to keep you at a good temperature. Each Spinning class will also have their own instructors with their own technique, goals and ability. If you test out one Spinning class and decide that it’s not for you then what you may need to do is simply try a different instructor. Certain instructors will target different demographics like young/old, male/female and fit/unfit. Every instructor will be certified but a Spin instructor really can make or break a class so it’s down to you to pick the class and instructor that suits you best. The average class will begin at a gentle pace for 5-10 minutes. The pace will gradually pick up throughout this period but it will stay similar to cycling on flat terrain. After this period you will enter into different intervals of seated and standing work dependent on the intensity. If you’re ‘climbing’ then you’ll normally be standing but expect to be on and off the saddle through the whole session. The instructor may also ask for you to ‘hover’ which is basically where you are leaning forward over the handlebars with your hips above the saddle and towards the back of the Spin bike. It’s a similar position to someone trying to gain a lot of speed at a slight incline on a normal bike. Make sure to pack a water bottle as you will get incredibly thirsty due to the amount of sweat you’re releasing. Also, wear tight fitting and light clothing so that you can move freely without overheating. The days after your class you can expect to have very sore legs which can be helped by stretching, foam rolling or getting a massage. Don’t worry, this is normal. Your muscles have to be broken down in order to grow stronger. Over time the amount of muscle ache that you get from a Spinning class will decrease because your body will have adapted but for the first couple of weeks the aches will be quite intense. Just as your body will adapt to the aches, you will also improve aerobically. Each class that you complete will be one step forwards. A few weeks will pass and you’ll look back to see how far you’ve come. You may have turned up the resistance on the bike or simply be pushing yourself harder each class but you will have definitely improved. You should also notice that your body composition has changed. Your legs should be bigger and stronger and your fat mass should have decreased. So “what is Spinning class” you ask? It’s an amazing, challenging way to get incredibly fit. All it takes is pushing through those first sessions as they are always the hardest. Once you do, don’t be surprised if you find yourself addicted. Join us and take a step toward your best self. Please check your email for a final confirmation step.